Sparrow Hawk, a small bird of prey of the falcon subfamily, and genus tinnunculus (Vieill. ), which differs from falco (Linn.) in having longer tarsi, covered in front with large transverse hexagonal scales. There are about a dozen species, widely distributed over the globe; their flight is very graceful, irregular, with occasional hoverings; they eat small birds like sparrows, mice and moles, lizards, beetles, and grasshoppers; the nest is made of a few loose sticks on a rock or in a hollow tree, and the eggs are four to six. The American sparrow hawk (T. sparverius, Vieill.) is one of the handsomest, most active, and abundant birds in the United States, and is found over the entire continent of America. It is 11 to 12 in. long, with an alar extent of 22 in. ; the crown is light red surrounded by blue, the latter color showing itself also on the wings; back light rufous, spotted with black; tail darker, with broad black band near the end, tipped with white, and lateral feathers with broad black bars on the inner webs; quills black, with white spots on inner webs; throat and upper neck on sides white, with two black bands on the latter; three spots on hind neck, and numerous ones on abdomen and sides, black; white below, tinged with yellowish on breast; the young birds have wider bands of black, and the females longitudinal black lines on the crown and stripes on the tail. The eggs are dark cream or light buff, more or less spotted with brown, nearly spherical, 1¼ by 1 in. ; both sexes incubate, two broods being raised in the south; the pairing time is from February to June, according to latitude. - The European sparrow hawk (T. alaudarius, Briss.) has been described under Kestrel. 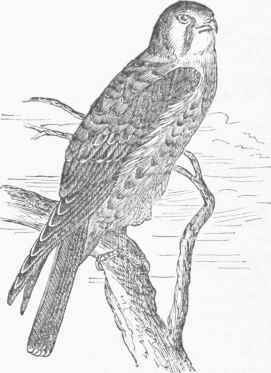 The accipiter nisus (Pall.) of Europe is also called sparrow hawk; the male is dark bluish gray above, reddish white below with yellowish red transverse bars; the female is grayish brown above, and grayish white below barred with dark gray. The size and habits are about the same in both. American Sparrow Hawk (Tinnunculus sparverius).